You won't believe what I grew this year. I wasn't sure, when I got the cat seeds, that they would take. I have heard that they can be very tricky to grow. Particular about the amount of sun and water. Finicky with weeds, and not thriving when planted near onions or garlic. He was a bit of a late bloomer. I decided to go with container gardening. I used the tabby variety seeds. I didn't use any compost, but I did fertilize with tuna and Meow Mix. Can you believe it? He turned out gorgeous, don't you think? Next summer I'm hoping to try some other varieties. My porch will be quite the showcase! Wishing you all a wonderful Thanksgiving with good food and loving family and friends. Cute!!! I hope you have a great Thanksgiving, Lisa, with your family and furry friends. A fine specimen of cat..he doesn't even need any pruning! :) Have a wonderful Thanksgiving! Haahaha.... Think I may just give those seeds a try next year when planting time comes around!! Goed gedaan je hebt kans dat je er volgend jaar wel veertien hebt. 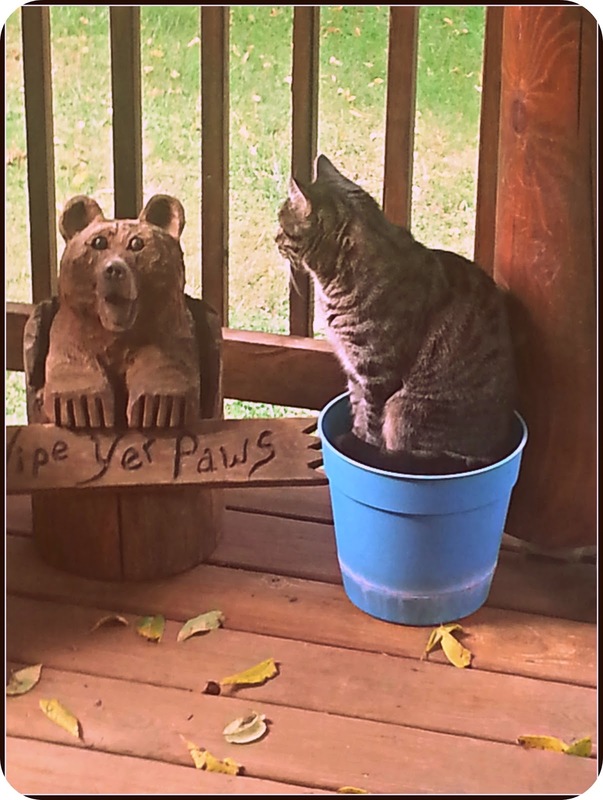 Looks like he's wondering why the bear isn't in a planter too? :) Happy Thanksgiving! that's adorable! thanks for the laugh! enjoy your thanksgiving! I love it! Cat-in-a-pot! thanks for the chuckle on a day when the Monkeys are fighting non-stop. Can you please save seeds this year and send me some? Well, now I KNOW you can grow anything!! Perhaps later you can add some catnip to the fertilizer, that might cause a big growth spurt. I guess you will be very busy preparing for Thanksgiving, we wish you a wonderful and warm one! Plenty of snow here and bad roads, I hope you don't have to travel. I want some of those seeds!! He is adorable. He favors Chase Bird, don't you think? I hope you and your four guys have a fun and safe holiday! We're supposed to eat at the Peaks of Otter, but the weather may change that. Happy Thanksgiving to all of you, Lisa. Oh Totally Joy - and Cuteness . . Thank you - AND - Happy Thanksgiving. You grow 'em BIG in your state! Ours is much smaller;) Same colors, though. Have a Happy Thanksgiving... You sure do have a 'green' I mean a 'gray' thumb. He sure looks quite healthy and happy there! You are hilarious. What a cute post!! LOL! And a cute picture! I want some of those seeds, lol! Oh my catness, that is SO darn funny!!!! I hope your Thanksgiving was puuuurrfect! You can't go wrong with homegrown cats. I trust he is organic?